Donguibogam Village, Sancheong-gun, Thursday 12 September, 9am. At the main entrance to the Expo there is a long parade of information booths and gift stalls. One of the booths was there to promote Hallyu 4.0. Hallyu 1.0 and Hallyu 2.0 are the first and second waves of Korean pop culture spreading through Asia. First came the dramas which dominated the TV schedules in Hong Kong, Japan and elsewhere: Winter Sonata, Full House, and of course Dae Jang Geum. At the same time as the dramas were making waves, there were the boy bands: H.O.T, g.o.d, Shinhwa and more; and the girl bands FinKL, S.E.S and the like. But the real Hallyu 2.0 came with the even slicker manufactured idol bands such as Girls Generation, KARA, SHINee and Big Bang, and the wave started reaching Europe and America. While the first two Korean Waves were more by accident by design, what came thereafter was an effort to sustain the existing tide, and also to create new waves. Hallyu 3.0 was an effort to extend the geographical coverage, and to deepen it. No longer was the focus solely on popular culture – though certainly such contents continue to be a priority. Art and literature were added to the range of things Korean to be introduced to the world, as well as traditional culture. There were initiatives such as Han Style (a focus on some of the elements which were perceived as particularly Korean: cuisine, music, domestic architecture, clothing). The Minister of Culture himself was rarely seen not wearing hanbok. Lee Charm, as head of the Korean Tourism Organisation, promoted some of the attractions of Korea other than popular culture – temple stays, hiking and the like. Hallyu 3.0 is about a more sustainable propagation of Korean culture – and Korean soft power – abroad. It is playing a longer game, and as such its success is much more difficult to monitor. Medical Checkup: In addition to the excellence of medical equipment, facilities and services, we have opened ‘Medical Checkup Center’ in which all medical examinations are focused for patients’ convenience and comfort. Aesthetic Surgery: With world-renowned sophisticated surgical skills and know-how for advanced cosmetic procedures, we provide the best plastic surgery outcomes devoid of any scars, and are available at reasonable prices. Cardiovascular Surgery: In terms of cardiovascuIar surgery, which requires the highest level of expertise and concentration, Korea has maintained high success rates with competent medical staff and state-of-the-art medical facilities including PET-CT and cyber knife robot. Herbal Medicine: Based on the advantages of Western and Oriental medicines, customized medical services are provided. Acupuncture, cautery and herbal medicines are also available. Dental Clinic: A variety of dental services such as Orthodontic treatment, implant, whitening and anti-aging treatment are available at low prices. Coordinators are on stand-by to help patients with consultations and personalized treatment. Infertility Clinic: New reproductive technologies such as test- tube fertilization and artificial insemination are available. High medical access rates have been reported. Skin Clinic: Professional skin treatments such as acne and wrinkle removal and skin whitening are provided by highly experienced and skilled dermatologists. Eye Clinic: Korea’s eye clinics are recognized for their outstanding sophisticated eye treatment. Laser surgery requires dozens of thorough tests including a DNA test and safety checkups for customers. We offer a one-day system where it takes only one day to go through all the procedures. 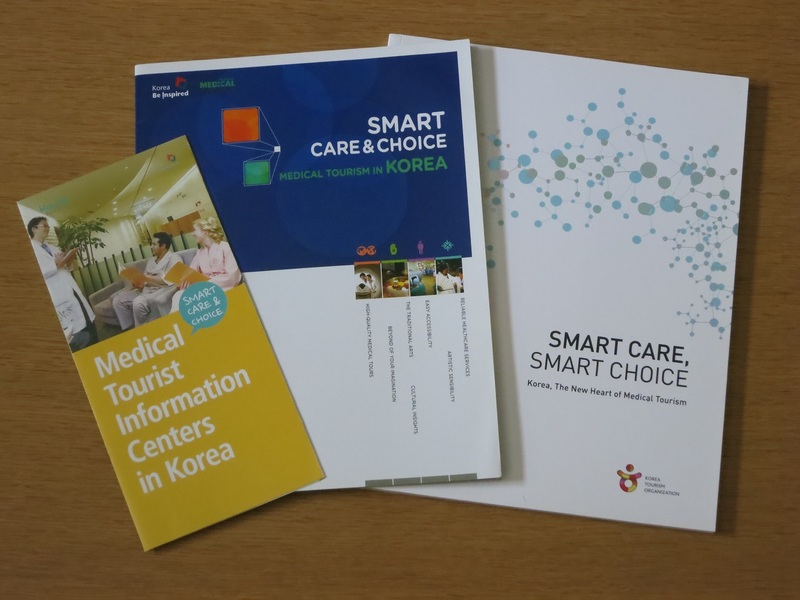 These services were expanded upon in a larger brochure introducing four Medical Tourist Information Centres in Korea (Jonggak in downtown Seoul, Incheon Airport, Seomyeon in Busan, and in downtown Daegu). This larger brochure contained suggestions about all the non-medical tourist activities you could bolt on to your visit. A third booklet got down to the nitty gritty: the various diseases you could have treated in Korea. Ominously, the Big C seemed to be the main draw: it had sections on Thyroid Cancer (“Korea, Country with the highest thyroid cancer survival rate in the world” was a good advertisement); Prostate cancer (“Proton therapy for prostate cancer: get treated at 1/3 of the price vs the US” appealed to those counting the pennies); Stomach cancer (“The world learns how to treat stomach cancer from Korea,” a sad fact, given that Koreans suffer from it more than most); and Rectal cancer (“Korea, the Mecca of laparoscopic surgery for rectal cancer” – a slogan which required a bit of prior technical knowledge). The other treatments featured in the book were Infertility, Spondylarthritis (“Korea’s various types of treatments with fewer side effects than surgery”) and Living Donor Transplantation (“Leader of living liver transplant – Korea” – a claim I can believe as I have a Korean friend who donated part of her liver to her mother). 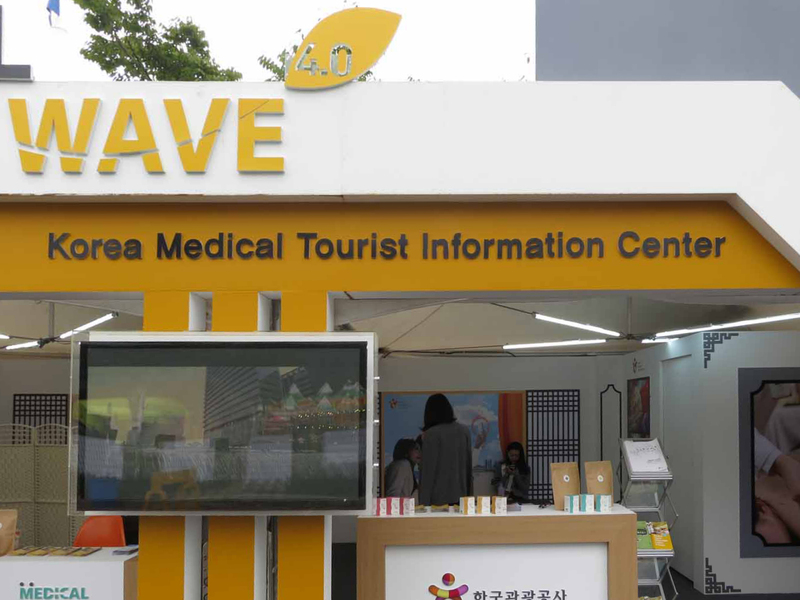 Each section had detailed case studies featuring people who had benefited from the high-tech treatments available in Korea. I was just about to visit a centre where the treatments were of a more traditional nature. The previous evening I had arranged to meet Mr Min this morning in the centre of the expo campus for a quick visit to the Healing Village. When I woke up, the rain was steadily falling and I knew I would get completely soaked if I ventured out. I make a couple of calls to cancel my engagements, and settle down to do my final bit of editing on the Institute’s publicity materials. The phone kept ringing, and the text messages kept pinging. What I thought had been arrangements for a casual look round the Healing Village had been interpreted as a full treatment with a qualified Traditional Medicine doctor. They will be sending a car for me, and will give me an hour’s consultation at 11am. Given that I’m perfectly healthy, and the traditional treatments I have witnessed always seem to involve massage, which I hate, I quickly squashed any notion of a treatment. And so thankfully we’re back to a simple look around, much to the disappointment of my hosts. The final page of the Sancheong Oriental Medicine Research Institute’s brochure, the one proclaiming the mission statement of Sancheong’s Enterpriser Cooperatives, is stubbornly resisting my attempts to get it into shape. But the clock is ticking and I don’t think I’m ever going to polish it to my satisfaction, so I make a few compromises and finally close the document on my tablet, just in time. The car arrives and we proceed to the Healing Village, a small compound of traditional buildings in a very quiet corner of the Expo campus. Just entering through the gateway instils a feeling of peace and harmony. Throughout the period of the festival you were able to book yourself into the Healing Village, where you could even stay the night in a simple hanok room. 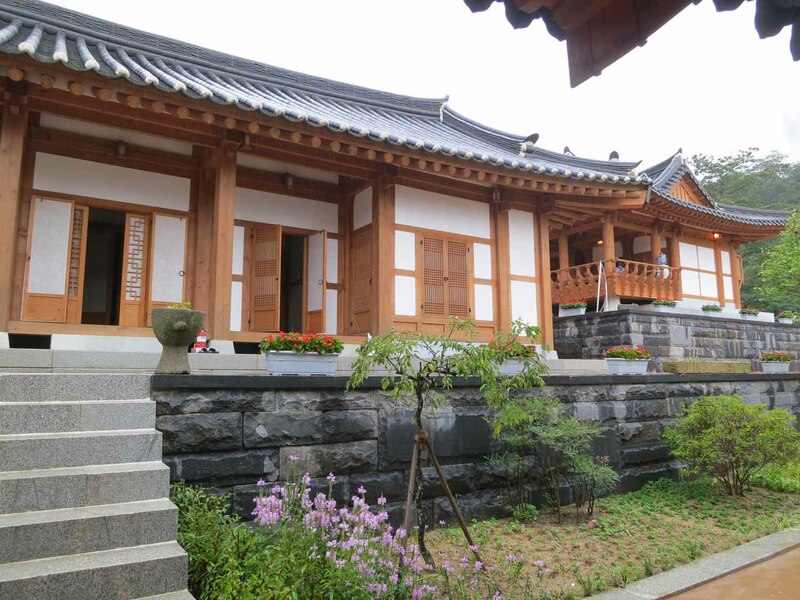 An experienced team of traditional medicine doctors from Seoul took up residence in the peaceful compound of traditional buildings. The visiting KBS TV crew were particularly taken with the senior doctor there, who was an excellent ambassador for the profession as well as being extremely beautiful. Sadly, she was not in the village when I paid a visit – maybe she was sealing a deal which would secure her TV fame. I was guided around the compound by a charming multilingual guide (Chinese, Japanese and very good English), given a very soothing massage on a water-bed equipped with turbo-charged water jets, shown the rooms where I could have a bath in a dark brown enzyme goo, and given a lightning quick diagnosis by a machine which told me exactly how much body fat I needed to lose (it was brutal to be told that I needed to be precisely the weight I was twenty years ago), and how much muscle bulk I needed to gain. All very true, but lacking in tact. There was one treatment suitable only for women: a commode combined with a herbal steam-bath.